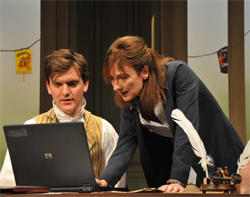 If you like Stoppard you will love this production of 'Arcadia'. Typical of the writer's work this is an evening which is truly a cerebral work-out. Switching between the early 19th century and the present day and touching on questions of literature, philosophy, mathematics and... gardening. A familiarity with Newtonian theory may help, but is probably not essential. Some may find this pretentious, but it is possible to just relax and enjoy the high-class acting of the Library Theatre cast – beginning a four-year residency at the Lowry. At the heart of the play is a whodunit in which modern characters investigate a mystery involving Byron, a sexual liaison and apparently a fatal duel. The actors must work hard to present a play of ideas in entertaining terms and for the most part they triumph. As the modern characters James Wallace and Cate Hamer make an effective detective duo – whilst in the earlier country house scenes Emma Gregory – as the titled lady and Charlie Anson - as the play's true intellectual, provide an illuminating contrast in styles. Particularly notable is Beth Park – who plays the teenage mathematical genius – torn between the attractions of the mind and her own sexual awakening. It is a beautiful production and the company appears to have adapted well to its new surroundings. This first play of the new era does test the audience's intellect, but is also entertaining for those who are seeking a sparkling evening of word-play, top-class acting, ideas and laughs. Tickets: Thursday 23 September - Saturday 9 October 2010. Monday £10; Tuesday-Thursday evenings £14, £12 (concessions £12, £10); Friday/Saturday evenings £18, £16 (concessions £16, £14, not Saturday); Thursday matinees £14, £12 (concessions £12, £10). Preview Thursday 23 September: all seats £10. Box office www.librarytheatre.com or 0843 208 6010.